Equal Exchange is more than a successful business. 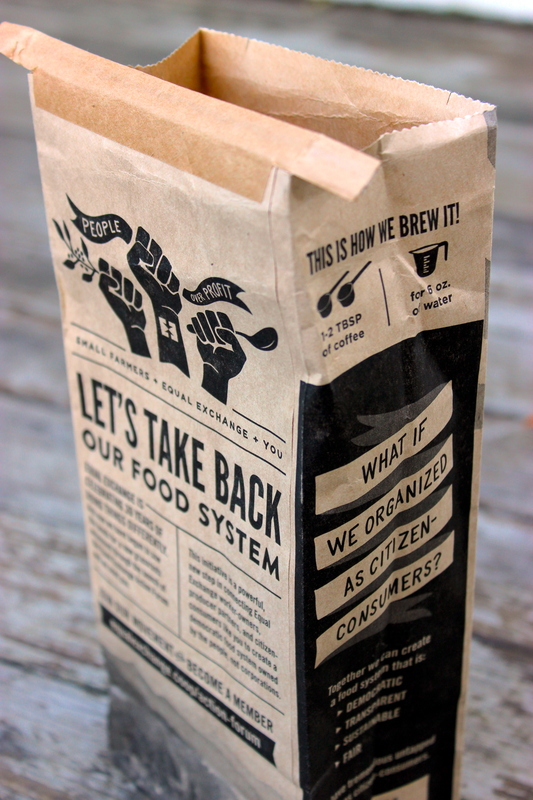 The worker-owned co-op not only preserves and protects the sustainability of its own business model, but also devotes resources to improve the food system their products depend on. This holistic outlook redefines corporate responsibility. Equal Exchange, probably as much as anyone, has struggled with competitor interpretations of corporate responsibility. The fight to keep Fair Trade authentic from copy cats continues. But Fair Trade is just one political topic that Equal Exchange stands behind. They take action for workers rights internationally and in their home state of Massachusetts. In the Congo, Equal Exchange has partnered with the Panzi Foundation that is combating sexual violence against women. Dr. Denis Mukwege from Panzi Hospital just won a Nobel Peace Prize for his work there. And Equal Exchange is proceeding with an intellectual approach to food production. They have a growing Action Forum educating consumers, activists, and investors. Somewhat undefined when it started, this forum has evolved into an expansive think tank where members learn about the market, the growers, and the environment that Equal Exchange products come from. Recent topics include environmental challenges, human rights, and democracy. This intellectual analysis is valuable, exceptional, and takes resources. But at the same time it is common decency. When I worked with business consultants, I was amazed at the intellect that came with high powered MBA degrees. But what struct me just as much was the lack of intelligence regarding the business ecosystem such as what Equal Exchange strives to protect. Growth in a vacuum is standard in traditional business. But if “value” is based on pure extraction of resources and profits, aren’t there obvious consequences? This lack of concern for real world effects inspired this blog with co-ops as a solution and my first blog post that covers this evident blindness in business. All resources need to be measured in the “economic throughput” (See author Herman Daly). Equal Exchange’s conscientious business model defines what smart is. Responsible intellectuals, according to Noam Chomsky in his essay “The Responsibility of Intellectuals,” speak the truth. Equal Exchange has boldly embarked on an intellectual assessment of food production and wants to educate the consumer on its realities. Equal Exchange empowers their suppliers. They further make this model transparent for the consumer. What Equal Exchange does isn’t easy. Their business is built on years of difficult decisions and risk. But their worker-owner model is willing to think through the impact of making money off of resources which I think is good business. What I learned at the People’s Food System Summit, June 2017, hosted by the Equal Exchange Action Forum. Meeting a food producer improves your life. Countries producing your food are REALLY suffering from global warming. Tea production is brutal for people that pick leaves by hand. Bananas require incredible logistics to reach you. 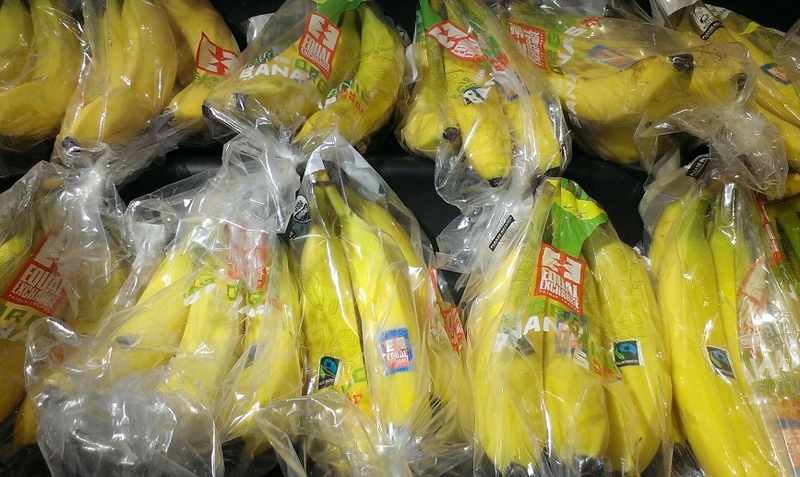 Cheap bananas serve the powerful. My September brightened like tropical sunshine when I found Equal Exchange bananas at Stop & Shop in Norwood, Massachusetts. There they were, occupying display space beside the ever present Chiquitas. The Massachusetts-based co-op, Equal Exchange, continues to advance fair trade food production internationally. It’s great to see evidence of it at a major grocer. Fair trade products and a broader food movement taking place are not only improving how we eat, they’re increasing political and economic freedom. This month, a thought-provoking article on CounterPunch by Jonathan Latham recounts a worldwide food movement in an article titled, Food Liberation: Why The Food Movement Is Unstoppable. The article describes food as a basis for economic thought. As the co-op movement brings to light, there are alternative ways to consider business interaction besides competition. The food movement brings with it a “philosophical shift” challenging food as a commodity and business. Food as an industry, descendant from western enlightenment thinkers, has become disconnected from natural interconnection. In Brazil a food movement is benefiting millions of children and small farmers with a top-down approach. Thomson Reuters Foundation reports on the world’s largest universal feeding project. A law dictates that 30% of school meal budgets must go to small farmers. Farmers and co-ops are benefiting: the predictable income allows them to obtain deeded land rights and reinvest in the land. Equal Exchange buys from co-op farmers around the world. They buy cashews from Tomy Mathew from the southern India state of Kerala. At an August event, he explained how fair trade has created a market in that region allowing a higher standard of living, including good wages. 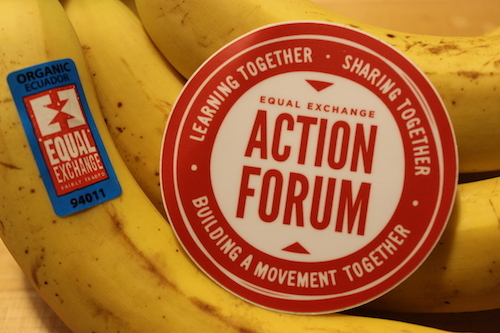 Equal Exchange is now looking to connect farmers and citizen-consumers with an initiative called the Action Forum. As Equal Exchange says: small farmers, big change. Many thanks to Chuck Bordman for this creative 48-second video about the corporatization of Fair Trade and the work of committed brands to support small farmers and Authentic Fair Trade in this context. To read the full comic book, “The History of Authentic Fair Trade, click here. To learn more about Fair Trade vs. Free Trade, click here. To learn more about Chuck Bordman and his work, click here.